UPDATE: 11-13-05. Dr. Sally Barbosa died on Saturday November 12, 2005, in the morning. She was suffering from cancer. WRITER, SPEAKER, EDUCATOR, VISIONARY, PSYCHIC, MESSENGER. The Puerto Rican Sally Barbosa is a doctor in Parapsychology, certified neuro-linguistic programmer (P.N.L. ), esoteric astrologer, expert in natural therapies, educator, speaker and writer. During the past thirty years she has been involved in the investigation and development of systems and techniques to utilize quartz crystals and other crystalline matrixes as agents of healing, transformation and ascension to new levels of life. She offers courses and workshops to train in the use of quartz crystals and other subjects within the field of human development in Puerto Rico, United States, Central and South America and Europe. In 1985 Sally Barbosa founded Proyecto Alas, Inc. , (Project Wings, Inc.), an institute for the full development of the human being, based on the philosophy that she presents in the book "Wings" ("Alas"), extraordinary work that teaches the human being to raise his own wings and … to fly. During five years she led the successful radio program "Conversing With You" ("Conversando Contigo"), the first one of the New Aquarian Age in Puerto Rico. This success was repeated in Radio San Diego, California, from 1997 to 1999. Considered an authority in the field of communications she has participated in radio and television programs in various countries around the world. In 1988 she founded the "Sorority Vesta" ("Sororidad Vesta") and the "Fraternity Helios" ("Fraternidad Helios") that gathers in brotherhood people of diverse nationalities, ages, socio-cultural and economic states, seriously committed with the processes of consciousness raising. In 1992 the "Peace Flag Committee" ("Comité de la Bandera de la Paz"), a non-governmental organism of U.N.O., awarded her with the Peace Flag, in recognition of her services for world peace. Dr. Barbosa has traveled across innumerable countries giving lectures, facilitating workshops and seminars over diverse subjects within the field of human development. Published in this website on December 30, 2004. Original in Spanish, translated to English by Luis Prada. Note of Editor: Earth is going through a cleansing process, many more natural disasters and geological Earth changes as the one that affected 11 Asian countries are expected to occur in the future. This article teaches you how to effectively send energy and spiritual support to those in need. See also the article:Earth Changes Are Coming. This is a call to all the voluntary workers of the Light and Love in service on Earth. We have incarnated in this Earth world in many, many occasions. We have lived in all the continents and have been members of all the nationalities, ethnicities and religious groups. We have had all type of relationships and spoken each language. The moment of redoubling our efforts together has arrived to complete the assignment that brought us to this orb. We commit ourselves to participate in a world transformation and in the healing of humanity of which we are a part. Asian countries affects us all equally warning us to pass individually and collectively from the state of dual consciousness to the one of unity. There are millions of fearful, suffering and anguished persons who need to receive a message of love and consolation in these moments. Let’s make arrive telepathically, employing the universal language of Light, a message of love and consolation to those who are fearful, anguished and suffering. We can do much utilizing Light, crystals of quartz, sounds and sacred geometrical patterns. The telepathic faculties of humanity have been incremented. Let’s gather ourselves in the service of ONE. We invite you to unite our crystalline Lights in a single UNITY. Fulfill your part, with your function within the Perfect Plan of Evolution. Relax as you are accustomed. Enter consciously in yourself through breathing. Take your quartz crystal with the dexterous hand and take it to the space between your eyebrows. Open the eyes and mentally formulate your message. Take care that your words be always the same. You can read it loud if you prefer. Repeat it nine (9) times. When you have finished remove your crystal from your forehead. The message arrive to those who wait for it while they sleep, pray or meditate. 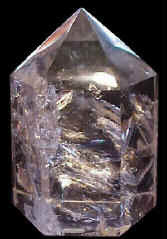 The transparent quartz crystal you employ to send telepathic messages must be perfectly clean. It is very important to wash it and purify it to eliminate any type of negativity that may have acquired. It is sustained with both hands and you breathe deeply. Breathing is retained and exhaled fast over the crystal visualizing and feeling that it is being cleaned. The procedure is repeated several times. If you prefer you can place it in sea water or in a solution of water with sea salt, during 24 hours or bury it in mud or in sea salt from 3 to 7 days. Then pass the crystal through the smoke of a bunch of salvia (Aloe Vera) mixed with similar herbs. Program it saying 33 times: "You are my transmitter crystal. Fulfill your function". Keep it in an container with sea salt or a wooden box or a carton after using it.